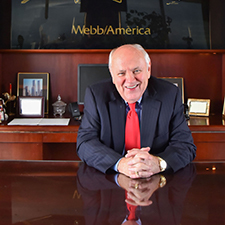 Dudley Webb, Chairman of the Board and Co-Founder of The Webb Companies, was born in the coal mining community of Hot Spot in Letcher County, Kentucky located in the heart of Appalachia. In 1969, Dudley and his brother Donald, both attorneys, established what is now the law firm of Webb, Hoskins, Brown & Thompson, where he retains senior partner status. In 1972, the Webb brothers teamed up to form The Webb Companies, a real estate development firm that managed everything from construction to marketing, leasing, brokerage, property management and ancillary real estate functions. Under their leadership, The Webb Companies grew into one of the largest real estate development organizations in the country, with projects across the U.S. from New York to San Francisco and Boston to Miami. Throughout his career, Dudley has served on a variety of national industry boards and committees including the Urban Land Institute, International Council of Shopping Centers, and the National Association of Industrial and Office Parks. Locally, he has been director of PNC Bank, Triangle Foundation, Bluegrass Community Foundation, Commerce Lexington, Downtown Lexington Corporation and many other philanthropic and civic organizations. Dudley has served on the board of trustees for Georgetown College and The Lexington School, and is a former member of the University of Kentucky Development Council. He and his brother Donald have also served as co-chairman of the American Cancer Society drives and co-hosts of the annual Cardinal Hill Hospital Telethon, a fundraising drive for the regional rehabilitation center. He currently serves on the Board of Trustees of Sayre School. Dudley holds a bachelor’s degree in business administration from Georgetown College and a juris doctorate from the University of Kentucky. He is a member of the Kentucky, Ohio, Fayette County and American Bar Associations.